On this day, did Saint Mauras, laid before the Altar on his hair-shirt, happily breathe forth his soul. On this day, the eldest disciple of blessed Benedict, securely ascending by the path of the Holy Rule, and accompanied by choirs of Angels, was led to Christ. On this day, the obedient man, speaking victory, was rewarded by receiving the crown from his Lord. Alleluia, alleluia. 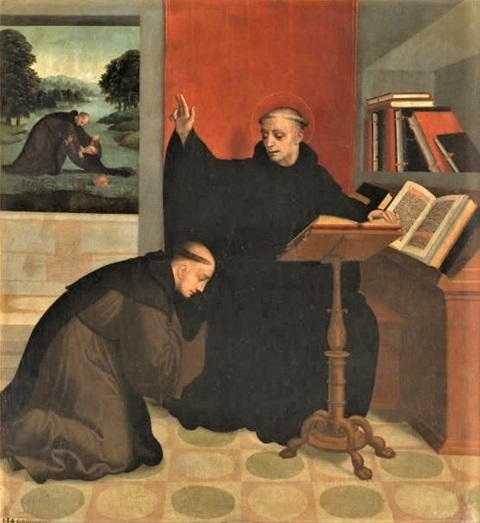 May the intercession, O Lord, of blessed Maurus, the Abbot recommend us to thee; that what we cannot hope for through any merits of our own, we may obtain by his prayers. Through our Lord Jesus Christ, thy Son, who liveth and reigneth with thee, in the unity of the Holy Ghost, God, world without end. Amen. O blessed Mauras! who, from early childhood, despised the world, and lovingly bore the yoke of the Holy Rule, and, being obedient even unto death, denied himself, that he might cling unreservedly to Christ. Alleluia. Saint Maurus—one of the greatest masters of the Cenobitical Life, and the most illustrious of the Disciples of St. Benedict, the Patriarch of the Monks of the West—shares with the First Hermit the honours of this fifteenth day of January. Faithful, like the holy Hermit, to the lessons taught at Bethlehem, Maurus has a claim to have his Feast kept during the forty days, which are sacred to the sweet Babe Jesus. He comes to us each January to bear witness to the power of that Babe's humility. Who, forsooth, will dare to doubt of the triumphant power of the Poverty, and the obedience shown in the Crib of our Emmanuel, when he is told of the grand things done by those virtues in the Cloisters of Fair France? It was to Maurus that France was indebted for the introduction into her territory of that admirable Rule, which produced the great Saints, and the great Men, to whom she owes the best part of her glory… St. Maurus built his celebrated Monastery of Glanfeuil, and Glanfeuil may be considered as the mother-house of the principal Monasteries in France, Saint Germain and Saint Denis of Paris, Marmoutier, Saint Victor, Luxeuil, Jumièges, Fleury, Corbie, Saint Vannes, Moyen-Moutier, Saint Wandrille, Saint Waast, La Chaise-Dieu, Tiron, Chezal Benoît, Le Bec, and innumerable other Monasteries in France gloried in being daughters of Monte-Cassino by the favourite Disciple of St. Benedict. Cluny, which gave several Popes to the Church—and among them, St. Gregory the Seventh, and Urban the Second—was indebted to St. Maurus for that Rule, which gave her her glory and her power. We must count up the Apostles, Martyrs, Bishops, Doctors, Confessors, and Virgins, who were formed, for… years, in the Benedictine Cloisters of France; we must calculate the services, both temporal and spiritual, done to this great country by the Benedictine Monks, during all that period; and we shall have some idea of the results produced by the mission of St. Maurus—results, whose whole glory redounds to the Babe of Bethlehem, and to the mysteries of his humility, which are the source and model of the Monastic Life. When, therefore, we admire the greatness of the Saints, and recount their wonderful works, we are glorifying our Jesus, the King of all Saints. Maurus was by birth a Roman. His father, whose name was Eutychius, and a Senator by rank, had placed him, when a little boy, under the care of St. Benedict. Trained in the school of such and so great a Master of holiness, he attained to the highest degree of monastic perfection, even before he had ceased to be a child; so that Benedict himself was in admiration, and used to speak of his virtues to every one, holding him forth to the rest of the house as a model of religious discipline. He subdued his flesh by austerities, such as the wearing a hair-shirt, night watching, and frequent fasting; giving, meanwhile, to his spirit the solace of assiduous prayer, holy compunction, and reading the Sacred Scriptures. During Lent, he took food but twice in the week, and that so sparingly, as to seem rather to be tasting than taking it. He slept standing, or, when excessive fatigue obliged him to it, sitting, or, at times, lying down on a heap of lime and sand, over which he threw his hair-shirt. His sleep was exceedingly short, for he always recited very long prayers, and often the whole of the Psalms, before the midnight Office. He gave a proof of his admirable spirit of obedience on the occasion of [Saint] Placid's having fallen into the lake, and being nearly drowned. Maurus, at the bidding of the Holy Father, ran to the lake, walked dry-shod upon the water, and, taking the child by the hair of his head, drew him safe to the bank; for Placid was to be slain by the sword as a martyr, and our Lord reserved him as a victim, which should be offered to him. On account of such signal virtues as these, the same Holy Father made Maurus share the cares of his duties; for, from his very entrance into the monastic life, he had had a part in his miracles. He had been raised to the holy order of Deaconship by St. Benedict's command; and by placing the stole he wore on a dumb and lame boy, he gave him the power both to speak and walk. Maurus was sent by his Holy Father into France. Scarcely had he set his foot on that land, than he had a vision of the triumphant entrance of that great saint into heaven. He promulgated in that country the Rule which St. Benedict had written with his own hand, and had given to him on his leaving Italy; though the labour and anxiety he had to go through in the accomplishment of his mission, were exceedingly great. Having built the celebrated Monastery, which he governed for forty years, so great was the reputation of his virtues, that several of the noblest lords of King Theodobert's court put themselves under Maurus' direction, and enrolled in the holier and more meritorious warfare of the monastic life. Two years before his death, he resigned the government of his Monastery, and retired into a cell near the Oratory of St. Martin. There he exercised himself in most rigorous penance, wherewith he fortified himself for the contest he had to sustain against the enemy of mankind, who threatened him with the death of his Monks. In this combat a holy Angel was his comforter, who, after revealing to him the snares of the wicked spirit, and the designs of God, bade him and his disciples win the crown prepared for them. Having, therefore, sent to heaven before him, as so many forerunners, a hundred and more of his brave soldiers, and knowing that he, their leader, was soon to follow them, he signified his wish to be carried to the Oratory, where, being strengthened by the Sacrament of Life, and lying on his hair-shirt, as a victim before the Altar, he died a saintly death. He was upwards of seventy years of age. It would be difficult to describe the success wherewith he propagated Monastic discipline in France, or to tell the miracles which, both before and after his death, rendered him glorious among men. St. Maurus coming to France in 543, founded, by the liberality of king Theodebert, the great abbey of Glanfeuil, now called St. Maur-sur-Loire, which he governed several years. In 581 he resigned the abbacy to Bertulf, and passed the remainder of his life in close solitude, in the uninterrupted contemplation of heavenly things, in order to prepare himself for his passage to eternity. After two years thus employed, he fell sick of a fever, with a pain in his side: he received the sacraments of the church, lying on sackcloth before the altar of St. Martin, and in the same posture expired on the 15th of January, in the year 584. The Responsories of the Monastic Office of St. Maurus. *And became like unto him. ℣. He looked and did according to the image that was shown him on the mount. *whilst obeying his Father in the hearing of the ear. ℣. Many waters could not quench his charity, neither could floods drown it. *And suffers himself to be deprived of his great consolation, that he may provide for his neighbour's salvation. ℣. Charity is kind, neither seeketh she her own, but the things that are of Jesus Christ. ℣. The path of the just, as a shining light, goeth forwards and increaseth even unto perfect day. *And he set the shoots of the Holy Order amidst the lilies of France. ℣. As a brook out of a river, he waters the garden of his plants. *And he laid the regal purple under his feet. ℣. Because he was humble in his own eyes, the Lord glorified him in the sight of kings. *And alone, he dwelt with himself under the eye of the all-seeing God. ℣. He prepared his heart, and, in the sight of the Lord, he sanctified his soul. *And dying in that battle, they won to themselves the triumph of heaven. ℣. They fought the good fight, they finished their course, they kept the faith. ℣. Thy altars, Lord of hosts, my King and my God. *My soul longeth and fainteth for the courts of the Lord. *With love of whom he burned exceedingly. ℣. For he was straitened, desiring to be dissolved, and to be with Christ. Also read – January 15, 2019: St. Paul, First Hermit, Confessor. St. Maurus, pray for us.